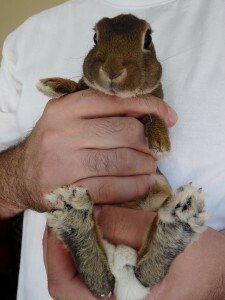 One of the 1st things to learn as a rabbit owner is how to pick up a rabbit. As long as your bunny has been handled from a young age they should have no problem with being pet and moved about but, if your rabbit has had a bad experience or has been dropped before, it may take some time to re-gain trust. Its also important that your rabbit be comfortable with you so that you can safely trim their nails. Start by placing you hand inside the cage. Don’t chase you rabbit around and get them all wound up, this will only add stress to the whole experience. Give you rabbit time to calm down before you try to take them out. 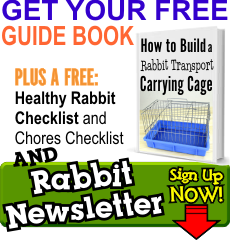 If you have difficulty getting your rabbit out of his/ her cage then think about switching to a cage that opens from the top. It’s a lot easier to get your rabbit out when you’re reaching in from the top and can save a lot of stress and chasing on both your parts. You can also start giving your rabbit a small treat right before you take them out of the cage and right after you put them back in so that they start associating good things with being picked up and moved around. 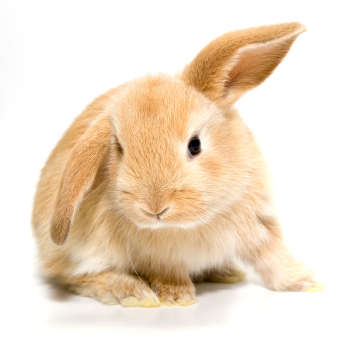 Don’t forget to check out the page on how to pet your rabbit to complete your basic handling skills!